Snapped this pic just as i was walking out of CAboom ~ not sure who the artist is (ideas?) 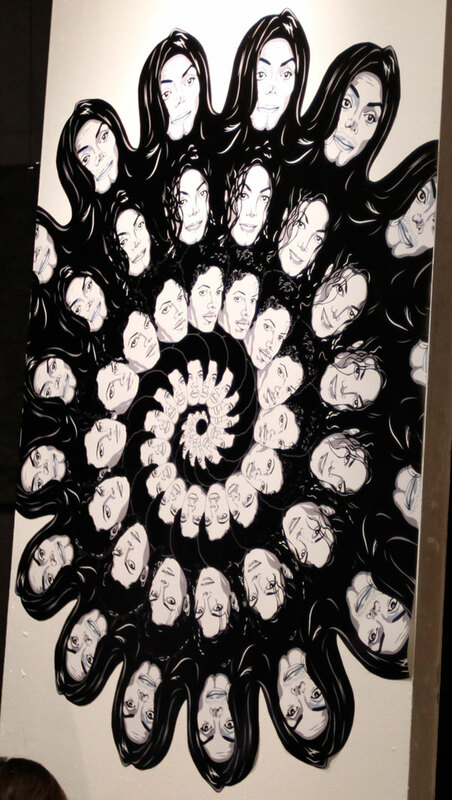 ~ but upon looking at it closer when i got home, its a pretty freaky Michael Jackson facial evolutionary spiral… see it up close on the next page. Are prints of this available for purchase? This is a real piece of art end let see how cruel aging is, plastic surgery or not, even to Michael Jackson. is there anyway you can update this post to include my name? this is spreading all over the blogoshpere, and I am not getting any creds. Peace, and long live MJ! This is seriously awesome. No need to comment on whether you are pro MJ or not. This idea was executed amazingly. 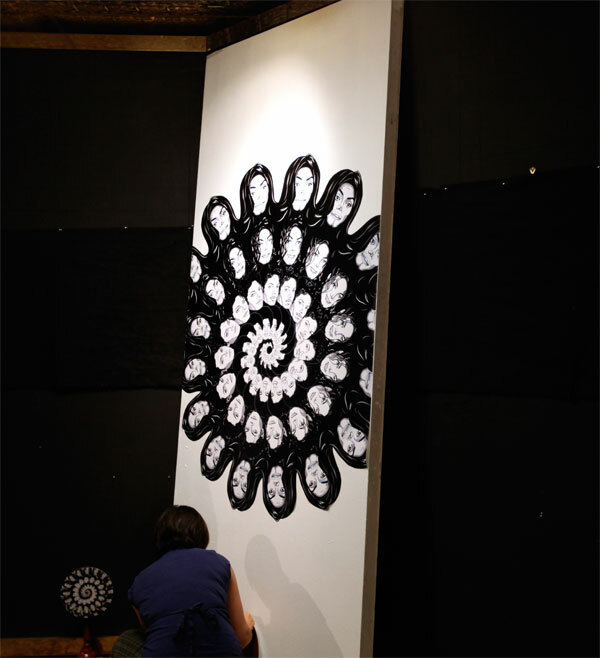 I agree with the artist approach… in context to a traditional Tibetan Mandala the purity always lies in the center and the farther you span out (past the gates) the demons appear. This reverse time line helps us relate back to his inner youth genius. Unfortunately the deranged Jackson never wanted to part from his youth. The world was recently saddened by the sudden loss of pop icon Michael Jackson. In memoriam of this legendary and one-of-a-kind performer, Ztarlet Star Registry has dedicated an actual star in his memory - as a symbol of the bright light that Jackson brought to the music industry and his millions of loyal fans across the globe. This should be made into a custom wallpaper, or even a wall drawing. There are a lot of white living room design that are perfect to feature this piece. am i the only one who thinks this piece of art is rather offensive at a time when we should be celebrating his legacy? wow, i think it is very beautiful. i would love to have a copy. If you ever make a t-shirt out of this please let me know. No matter what you are anyone else thinks - the FACT remains that Michael Jackson was A HUGE FORCE in this world. There has been NO ONE quite like Michael Jackson that had the AURA and that something “SPECIAL” that can’t really even be described. There is no artist on the scene that can even be display what Michael Jackson brought to us all. The world really LOST something significant the day Michael Jackson died. I never bought any of his recordings and I never will. He was a great artist but a disgusting human being - let’s not forget that he was a child molester who no doubt left mental scars on his young victims. ok.. so that little one on the floor? did they fill the whole board too? He is white on all of his portraits!? since when? 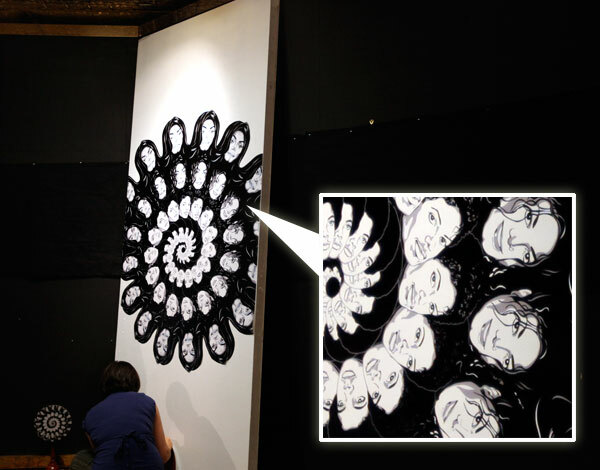 I see that the artist really manages to capture the “transformation” … G! I guess its OK to make business out of other ppl’s tragedy!